At Redgate, we spend a lot of time developing ingeniously simple solutions to very complicated problems, typically those faced by database developers. It’s hard work but it’s rewarding work too and our software is in use by many of the world’s biggest companies (and a lot of smaller ones too). Every now and again, though, we hold a Down Tools Week, Redgate’s version of a hack week. A week during which the software development teams, as well as those in other areas of the business, literally down tools to work on new projects. The idea behind it is simple. It gives people a break from the regular routine, allows them to work on ideas that interest them or inspire them, and gets different people in the company working together in different teams. The challenge is to work on a project for one week and, come Friday afternoon, present the results of the work. Was it a success? What was learned? Did it resolve a problem? Has something useful come out of it? The ideas for Down Tools Week projects are suggested by people at Redgate and then voted on by people at Redgate. It gives everyone the opportunity to come up with an idea, or support their favorite idea – and prompts quite a few heated discussions along the way. We also try and include a charity-related project from outside Redgate to spice up the mix a little. People are then free to join whichever team they choose, to work on the project that inspires them the most. 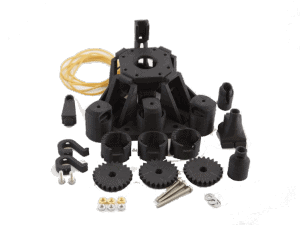 The WaterScope is a 3D-printed microscope combined with a Raspberry Pi and Android tablet or smartphone to quickly analyse water quality in the developing world. This is a system under R&D and WaterScope , a not-for-profit organisation, needs help improving the quality of the image processing, as well as advice on how to simplify their website and the instructions for building the microscope. DLM Dashboard is a free Redgate product that tracks database schemas and alerts users when they change. A team of Redgate people want to spend a week of concentrated effort to see how it can be made even more useful. Releasing software can be a complicated process. This project is to look into ways of reducing the steps involved, and has the potential to make it easier for our customers to handle their releases in a simpler way as well. Down Tools Week isn’t just about the work. It’s about collaborating with people from different parts of the business to find solutions to challenges that, while interesting, are complicated. To help the process along a bit, we encourage people to unwind, relax and share their progress over a drink or two and some food too. Every evening of the week, one of Cambridge’s best street food vans will be visiting the Redgate office to serve free food. Wednesday: Tapas Azahar (serving Pollo ajillo with Patatas a lo Pobre (Garlic Chicken with Fried Potatoes with red and green pepper, garlic and onion.) OR/ Veg option: Tortilla with Piquillo Pepper and alioli served with a Andalusian Moorish salad. Down Tools Week has just begun at Redgate and five teams are now hunkering down to work on their chosen projects. What will be the best project? The best T-shirt (each team have to produce a branded T-shirt)? The biggest learning experience? I don’t know. Which is what makes Down Tools Week so interesting. More news when it’s over.